I love Oklahoma City. For the most part. The people are mostly good. The road construction is...possibly going to finish up someday. And the food. 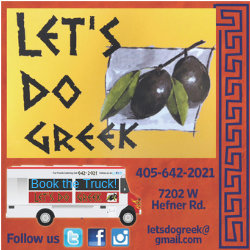 Oh, good god, OKC’s food scene improved by leaps and bounds over the last decade. We no longer apologize to people when they come to visit. That doesn’t happen anymore. But as easy as it is to get all wound up in the food scenes in Oklahoma City and Tulsa, it’s important to remember that a rising tide lifts all ships. Which is to say, the rest of the state isn’t exactly eating cold Chef Boyardee from a dented can. 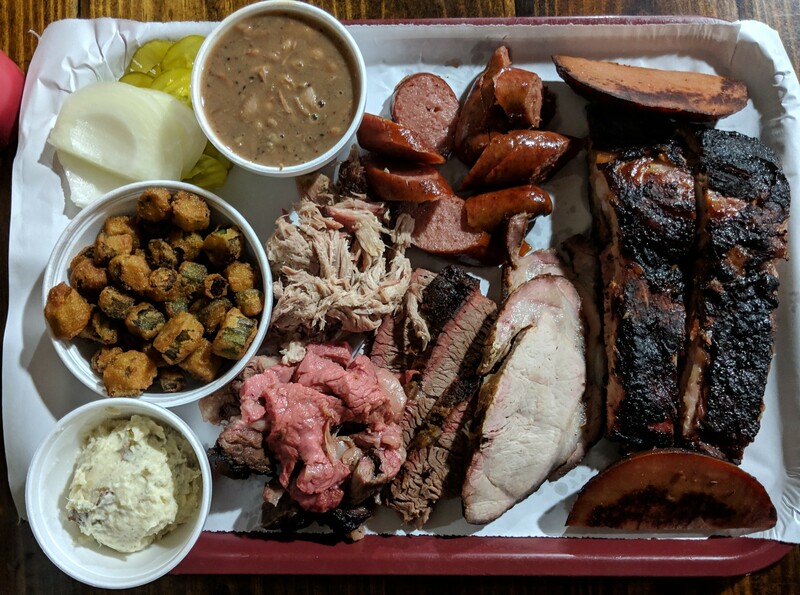 With a little (RE: a lot) of help from the folks at Chickasaw Country, I spent a weekend indulging my taste buds and even doing a few minor non-food-related things down south. The door was locked when I first pulled up to McGehee’s, but the parking lot was bustling. Other cars had made the trek down some twisty, windy roads in Marietta and found their way to this rustic restaurant, but everyone was waiting for owner Wanda Shellenberger to let us in. The menu here isn’t quite as focused as I had first imagined, with a few steaks and burgers, but I wasn’t under any illusions about what I’d be ordering. “It would be cheaper to buy catfish from overseas, but my customers would taste the difference,” Wanda said. 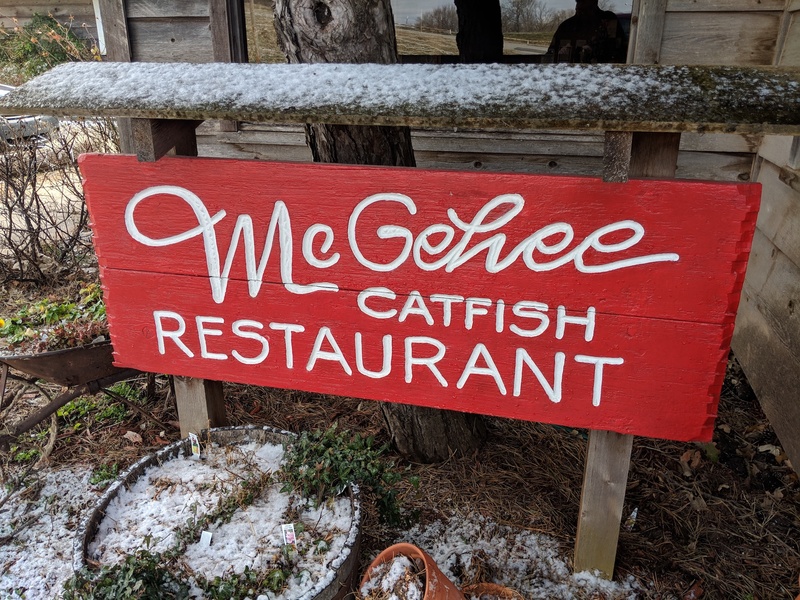 Since 1972, McGehee’s has been feeding folks in Marietta some of the finest catfish around and she’s not about to take a chance on sullying that relationship just to save a few bucks. If you love fried catfish, this is a must-stop for you, because it’s all-you-can-eat with french fries, hushpuppies, coleslaw and green tomato relish. The crust is a crispy cornmeal with a family-friendly amount of seasoning, so don’t be afraid to ask for some hot sauce if you need to crank it up a bit. It’s a large, but fairly thin filet, which means the interior cooks quickly and retains the perfect amount of moisture without being too soggy for the breading. It doesn’t come out in a huge bucket, either. Your server stops by every few minutes to see if you’d like another filet or two, which is then freshly fried for you. That’s when catfish is at its best, right? It’s not exactly a great dish to reheat the next day. That said, if you’re less-inclined to fried foods, they also do a grilled catfish with your choice of mild, cajun or blackened spice. I’m sure it’s evident in the fried, as well, but the quality of the fish really shone through on the grilled catfish. It was juicy, with a clean (not muddy) flavor that provided a perfect canvas for the seasonings. Squeeze a little lemon on top and it’s just about perfect. 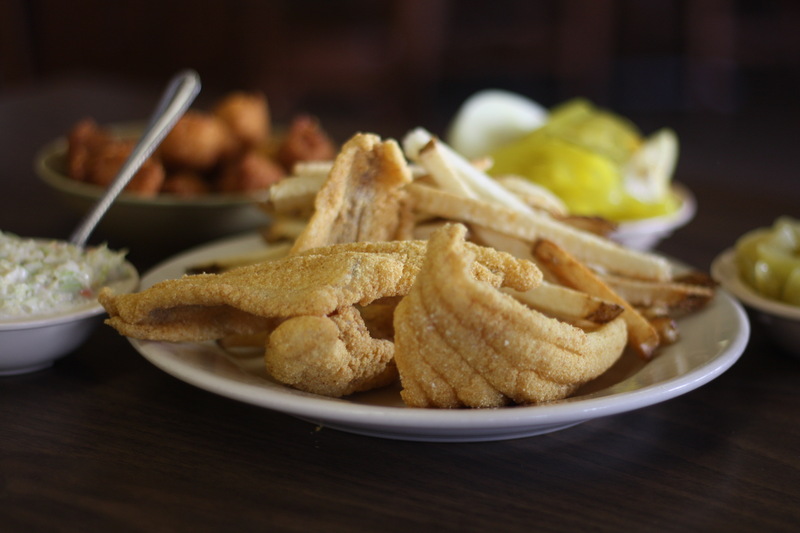 McGehee’s is only open for dinner on Thursdays and Fridays and lunch and dinner on the weekends, so you best hope your catfish craving doesn’t hit early in the week. If we’re being honest, doesn’t pie already feel indulgent enough? Like, most times you’re having pie, you’re mentally tallying what you’re going to have to eat tomorrow to balance it out, so does it really need to be fried? No. But also yes. 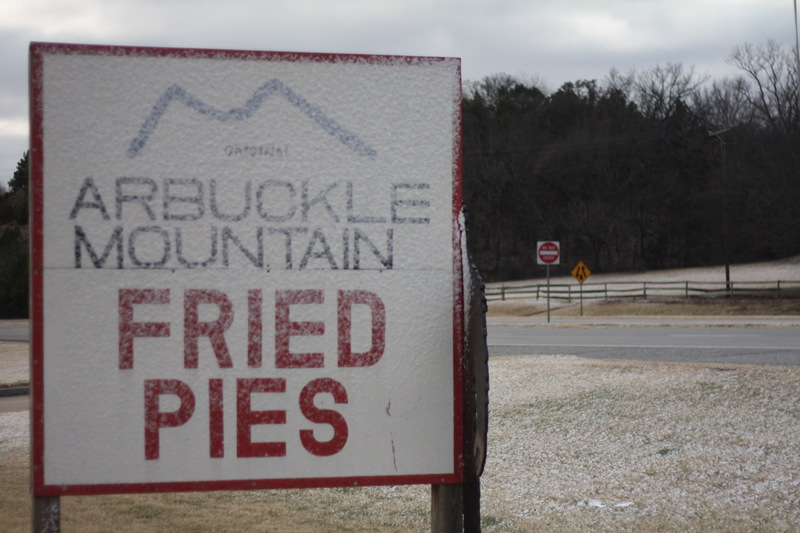 Because it just takes a taste of freshly fried pecan pie from Arbuckle Mountain Fried Pies to remind you that adding dough to bubbling oil is only going to make things better. 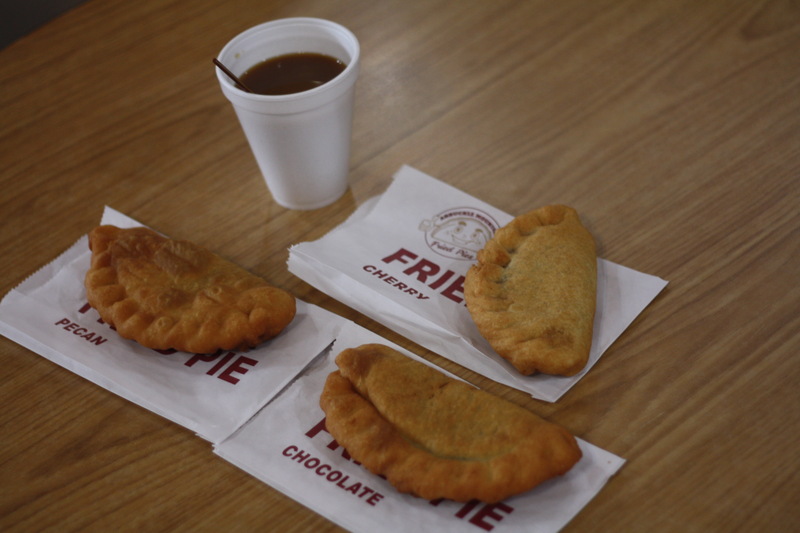 Not that the name lends itself to grandeur, but this fried pie shop is also a working gas station, so get any ideas of frilly whimsy out of your heads now. Outside are a couple of pumps. 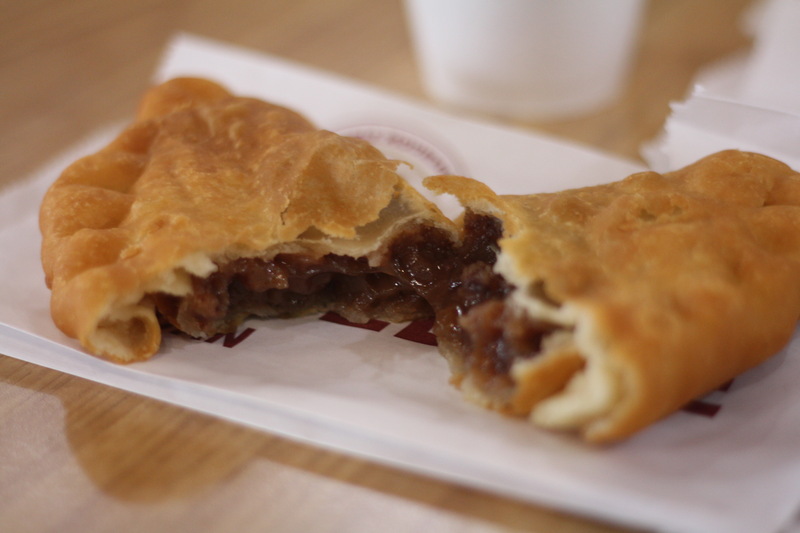 Inside is a massive kitchen with teenagers manning a line of pie fillings with ice cream scoops, plopping big balls of chocolate filling, cooked cherries, tender apples and more into flaky pie crust rounds before they’re dropped into a vat of hot oil. 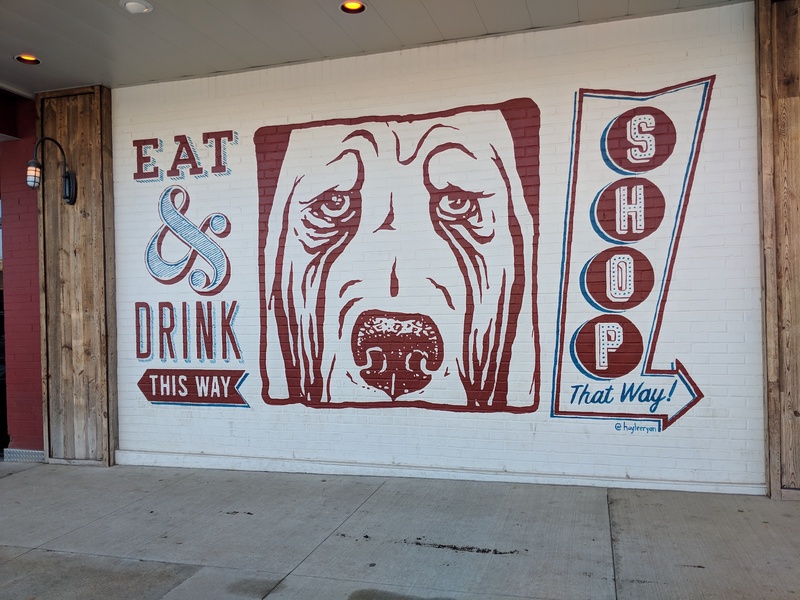 Most folks just get them and go, but there’s a surprising spacious dining area (and bathrooms, because this is a stone’s throw from I-35) in case you and your friends want to dig into those pies in a hurry. The pecan pie is legit wonderful, but the chocolate cream was even better. So creamy, like a chocolate custard, with no bitterness and a good amount of body, so the filling wasn’t runny. Are you allowed to stop at Arbuckle on the way into and out of town? Absolutely. Absolutely you can. This wasn’t my first time at Smokin’ Joe’s and it certainly won’t be my last. If you’re the type of person who likes to argue about who has “the best” barbecue in Oklahoma, then you ought to already know about this Davis mainstay. The business started off as a gas station and an RV park, but once the Wells family started cooking barbecue, things really took off. The restaurant has grown in size and popularity, as evidenced by the packed dining room and the list of meats already crossed off when I arrived. Smokin’ Joe’s has a more expansive barbecue menu than many of its competitors. There’s all the usual stuff, of course. Try to open a barbecue joint without brisket, pulled pork and ribs. Just try it. But in addition to those, you can find smoked bologna, hot links, polish sausage, pulled chicken and...pork tenderloin? Wow. You really don’t see that. Still, the real ruckus ought to be the 16 ounce smoked ribeye. Basically, Smokin’ Joe’s barbecues a prime rib and then shaves you off a gorgeous hunk of medium-rare beef that will give your favorite steakhouse a run for its money. The crust is peppery and glorious and the meat is tender and juicy. I’m not saying you should pick it up and rub it on your face, but I understand the compulsion, you sick freak. The ribs are a must. You can pick them up, if you want, but do something fun for me first. Take your plastic fork and put it, tines down, on top of the rib meat. Now turn. Look at how tender and luscious that meat is. Brisket is great. Truly, I get the appeal of brisket. But when it comes to the barbecue that makes my taste buds stand up and salute, it’s almost always ribs and Smokin’ Joe’s didn’t put “rib ranch” in the name for nothing. These are honestly some of the best ribs I’ve ever had. Just do yourself a favor and take your Prilosec first, because these will repeat on you. The only thing that feels better than eating yourself into a coma is when you get to fall into that coma in a really plush bed. The juxtaposition of the town of Sulphur—a sleepy little downtown that could easily be a painting of small-town America—and the luxury of The Artesian is almost jarring. Once inside the building, there’s nothing small-town about the decor or service. It doesn’t feel new, per se, but everything has that sheen of care. It just feels like the people maintaining the building are deeply invested in keeping it in top shape. I won’t go into too many details about the rooms, because I mostly spent time in there sleeping, but everything was lovely and clean and it felt like my own private getaway, where my belt buckle could get some much-needed slack after hours of attempting to keep my pants up. That respite was short lived, however, because I came bounding (actually, I just groggily rode the elevator) downstairs the next morning for breakfast at Springs at The Artesian, where executive chef Theron Jessop is doing wonderful work bridging the gap between his high-end culinary training and the straightforward steakhouse fare expected by area diners. 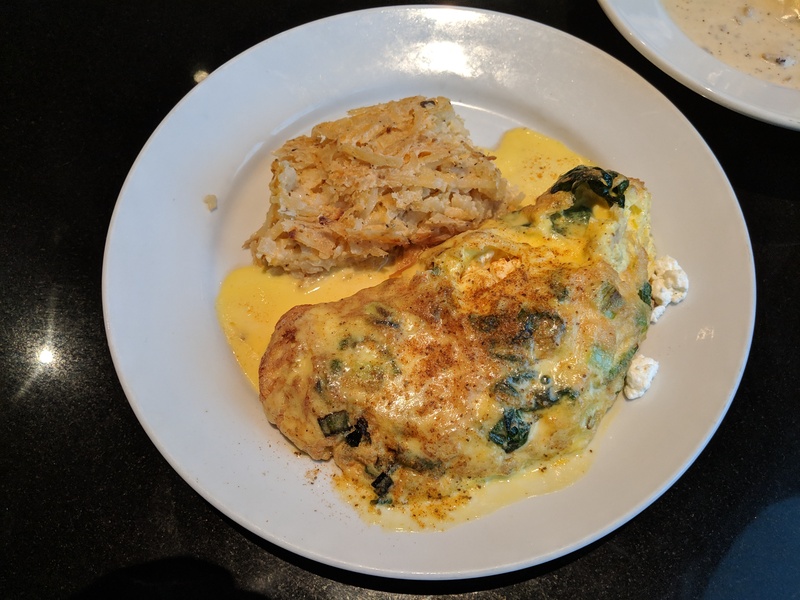 While I was tempted to go old school with a couple of eggs and a pile of crisp bacon, I settled on the entirely too decadent crab and goat cheese omelet with Old Bay hollandaise. Oh, man, this dish ought to come with an extra night’s stay, because I was ready for a nap once I finished. Time to walk off some of those calories! And then immediately eat more calories! Upon arriving at the Chickasaw Cultural Center, I was reminded of the gorgeous Crystal Bridges Museum of American Art in Bentonville, Arkansas. It’s a massive, sprawling complex with different buildings dedicated to every facet of Chickasaw life spread out over more than 180 acres. One thing I appreciated was the idea that, while history is addressed, the reason it’s called a cultural center and not a museum is because the Chickasaw Nation is still alive, still going, still embracing their past and creating their future. Take a walk through the village to see things like the council chambers, the ceremonial mound and the other buildings. People who see it from a distance often think they are tipis, but they’re permanent structures based on real, historic buildings. This is one of those hidden gems where I will absolute take my kids this summer, because I think it’ll wear them out and they might accidentally learn a thing. But I’m most interested in going back to the cafe, where the menu are full of Native American dishes I wish were making their way back to the city. Yes, you can get Indian tacos. Of course. And they’re delicious. But what about pashofa? It’s this creamy hominy and pork stew that’s incredibly hearty. Liberally dose with salt and pepper, because it’s a bit bland otherwise, but why isn’t there a version of this being served all over Oklahoma? 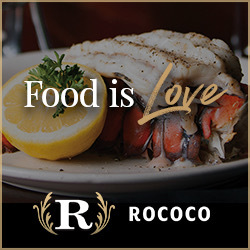 We always talk about being local, but this is food that actually has a connection to our history! Pashofa should be an Oklahoma delicacy that visitors return home talking about. C’mon, chefs, work with me here. The grape dumplings are also ridiculously tasty. Think of a flat dumpling, almost like a noodle, but instead of enrobing it in a savory sauce, it’s drenched in a wine-esque grape syrup. Oh, my, yes. 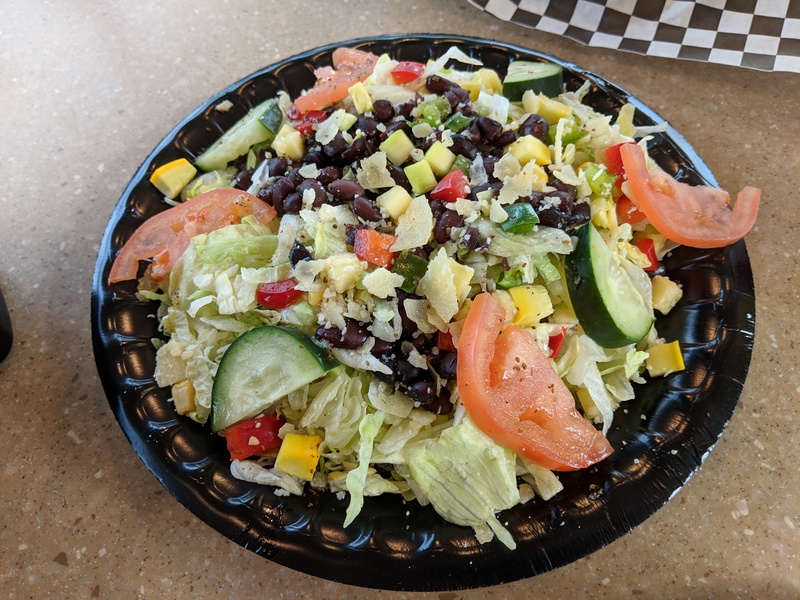 The Three Sisters salad features corn, squash and beans (aka the three sisters) in a light vinaigrette, which is a good reminder that you can eat healthy food without relying on a big, fried piece of bread as a base. 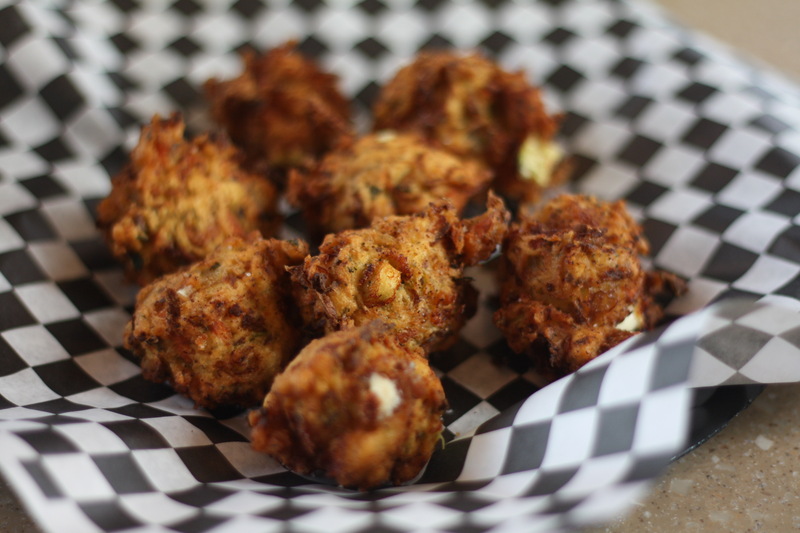 And, look, I can’t imagine zucchini poppers are super traditional Chickasaw fare, because I don’t think any civilization would lay claim to the idea of “poppers” as their cuisine, but these are tasty as all get out. Shredded zucchini, cheese, hot oil—you can’t deny the appeal. Thank goodness my companion accidentally spilled half the plate on the floor, because I would have housed these things until I had to be rolled out. Hey, I’m not going to pretend I’m super into country music just because I went to Blake Shelton’s restaurant. But I am super into the food served at country music bars like Ole Red, because there’s something about singing about heartache, trucks and being drunk that pairs perfectly with homestyle eats. Fried green tomatoes are wonderful and I defy any of you to convince me otherwise. The fat of the fried breading gives a savory cushion for the tartness of the tomatoes in a way that tickles my taste buds in just the right way. Green tomatoes are beloved in Chickasaw Country and I get it. 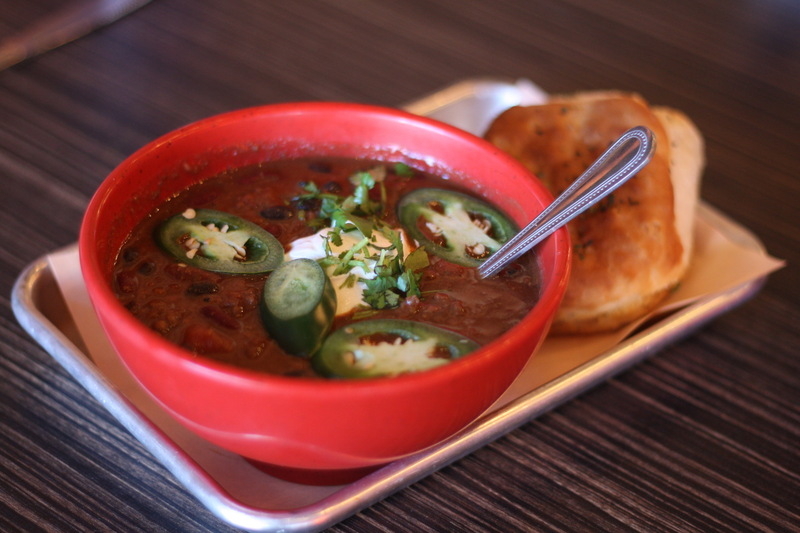 After sharing a pile of those with your friends, I found the brisket and bison chili to be deeeeeeep with red chili flavors. The sour cream keeps the heat at bay, but if you’d rather experience the full burn, you might ought to ask for it on the side. I also really loved the slices of fresh jalapeno, which added a huge bump of green flavors and some added texture. There are big pieces of meat as well as a couple of types of beans, so this will keep you well and truly full for the long haul. Not that you need a side, but the beer mac and cheese was delightful. And, hear me out here, what really made it click was the beer flavor. I love macaroni and cheese regardless, but it can get very goopy and thick and, hey, there is such a thing as too much cheese. Mac and cheese requires a cheese sauce and that means more ingredients than just cheese and heat. Beer in the roux (I’m guessing) gives it a thinner base to melt all that cheese, but also there’s a wheatiness that comes through in the sauce that I really enjoyed. If my trip to Chickasaw Country taught me anything, it’s definitely that thing about how the Chickasaw didn’t use tipis. But if it taught me a second thing, it’s that there’s a whole lot more to eat and drink south of the metro that I need to get to soon. BTW, I 100% stopped for more fried pies on the way home.